When we decided on the itinerary for our one-month trip to South America, we realized right away that checking a bag on each of our planned flights would be a big hassle and an even bigger expense. I’ve been packing incrementally lighter for several years, but the idea of carry on only travel for a month is still intimidating. I’ve always loved to pack for trips. Part of this is the excitement I get from thinking of all of the places I will go and trying to imagine being there and planning the things I will need. The challenge for this trip is that we will be visiting very different climates during the southern hemisphere’s fall season. Easter Island will be hot while Torres del Paine in Chile’s Patagonia region may get closer to freezing with wind and rain storms. So we need an all-season wardrobe that will keep us warm and dry, but won’t be a burden to haul around when we don’t need them. Small backpack. I carry a Kelty Women’s Redwing 40 liter and my husband, Kevin, has a Kelty Redwing 44. We both really like traveling with these bags. Each one has a large main compartment that zips open completely, roomy side pockets and compression straps on the sides to shrink the load a little more. Quick-dry clothing. I pack mostly synthetic fabrics that are quick drying so that I can wash them in the sink when needed. Layer! I get cold easily so I bring lightweight clothes that to take off or put on as needed. A lightweight laptop (if you need one at all). I’ve never traveled internationally with a laptop. I’ve always been able to get by using internet cafes, computers at the hotel or hostel, and, more recently, my smartphone. But with the increasing availability of wifi, the need to back up the photos on our camera, and (last, but not least!) this blog, I thought it was time to try. I just recently upgraded to the 11.6″ Macbook Air. It is surprisingly quick, even when processing photos in Adobe Lightroom. Learn from past mistakes. One lesson I’ve learned is to never skimp on facial care products. Travel does awful things to my oh-so-sensitive skin. When I’ve tried to skip a step in my normal routine to cut the number of products I bring, I’ve come home broken out and regret it. Bring the things that are important to your daily routine, just, in this case, pour them into smaller bottles. 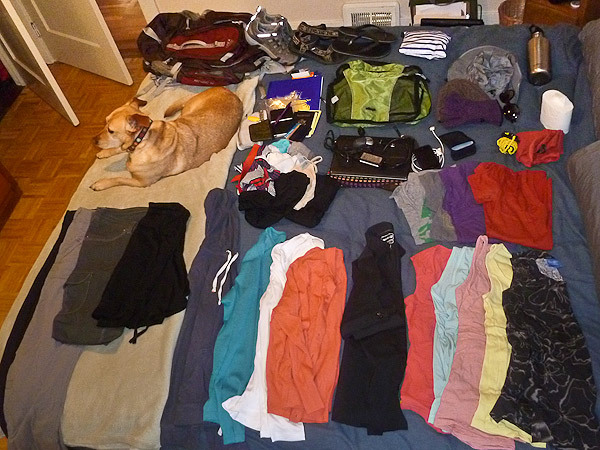 Here’s what I’m taking (minus the dog). And again, this is a bit more than half of what my husband and I are taking together. I have all of our personal care, first aid and most of our electronics, but he will have our DSLR camera and accessories (NOTE: Here is our associated Men’s Packing List for Carry On Only Travel). Charcoal gray quick-dry shorts. I have (and love!) this pair by Kuhl. Flip-flops. This sturdy (and cute!) pair is comfortable for walking. A good travel guidebook, like those published by Lonely Planet. Personally, I prefer print guidebooks, but if you use a Kindle or tablet you might like their e-book versions (HINT: If you are only visiting one city or region and don’t want to carry the entire, heavy book, you can buy e-books or individual chapters of any of their book at their online store. You can then use them on your tablet, e-reader, or print out a copy–and not feel bad throwing it away when you move on. Point and shoot camera—UPDATE 2/2015: Since I upgraded to the iPhone 6, I’ve been using my phone as a compact camera and I no longer carry a separate point and shoot. I always travel with a DSLR camera, which is included on my husband’s packing list. Daily facial sunscreen–I use this one. It’s not greasy and looks smooth under makeup. Motion sickness medication, Sea-Bands, or this Reliefband, a high-tech motion-sickness prevention wristband that I’ve been testing out that seems to work well. Silicone ear plugs, like these ones or the kids size if, like me, you have small ears. Silicone ear plugs are much more effective than the foam ones but they are nearly impossible to find outside of the U.S., so I always bring a whole box! They are life-savers when you wind up in a noisy hotel room or you need to sleep on a bus, train, or plane. Neosporin–this small tube is perfect for travel. What are your tips for packing light? 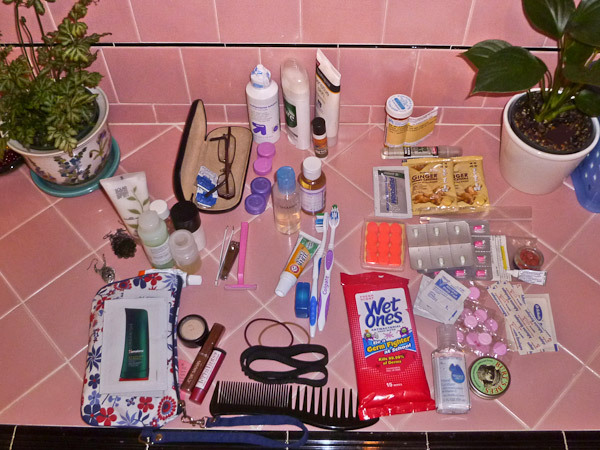 What’s on your personal carry on packing list for women? Note: The product links use our affiliate program which means a tiny fraction of anything you buy through them go to support our site. I would never recommend something I don’t use personally or believe in. You are so prepared… I wish I was prepared like you when I went to Aus. I had to buy everything there and oh boy, shampoos were expensive. Vee, I’ve read a lot of online packing lists 🙂 So shampoo there was expensive, even for you after having lived just prior to that in Hawaii? Crazy…any ideas why that is? Cassie, shampoos are expensive in Australia because Aussies don’t wash their hair often? Hehe… probably bc it’s an island. Darn, I have said two faux-pas in one comment. Woohoo! Happy to see you’ve included a safety whistle. No one wants to be chased up a hill by monkeys, right? 🙂 Added your packing list to my resources page too, thanks for a thorough roundup. Hi, thanks Jodi! You have a very comprehensive collection of resources on your site. Also, after we bought our ticket to Chile, one of the first things I did was listen to an interview you did on one of the podcasts I listen to. Thanks for your great work! I’m surprized that you can get thru the airport safety check, with all the liquids in your carry-on luggage? I’ve lost 2 x $14 pairs of Cuticle Sicissors and Nail Clippers @ BKK Airport in the past few years. No “sharps” are allowed. I also am stunned at the size of some passenger’s carry-on luggage! Yes, no problem fitting them into our baggie of the allotted size! I’m surprised you were hassled in Thailand! Our experience has always been that security is only strict about silly things in the US (liquids, shoes, and most recently I was hassled for a package of spaghetti!) We’ve found airport security to be a breeze everywhere else. Nail scissors…sheesh! And concealer! I do always pack concealer! Thanks for the backpacking tips. Can I ask what type of hiking shoes you took with you? I’ve been looking for a smaller pair that’s not too bulky. The ones in your picture look perfect! Great list – furiously taking notes for our upcoming trip (well, except for the clothing of course!). Is there anything you’d add/change to the First Aid kit part out of interest? Hi Stefan, I’m glad you find this useful! And no, there is nothing I would change about the first aid kit. Everything was small and didn’t take up much space. If you need anything else you can buy it at your destination. There are some clothing things that I would change if I had to do this kind of a trip again — like bringing a nicer pair of sandals so I didn’t feel like a slob in nice restaurants in Lima wearing plastic flipflops with my skirt and nice shirt, but that doesn’t affect you 🙂 Everything we took for the W-trek was spot on. Hope that helps! Yes, definitely! Probably at least four of the medium size would fit, depending on how full you stuff them. I usually only use two of them and there is plenty of space for other things. Safe travels to you! Quick question: all of this fit inside a 40L backpack? Yes, I packed it all into the Kelty Redwing 40L shown in the picture. Safe travels to you! I just bought this same backpack and was feeling apprehensive about using it as my main piece of luggage on my upcoming trip to Europe. So glad to have stumbled upon your page to see all that can be fit inside – it has put my mind at ease. I’ll definitely be getting some packing cubes too – thanks for the idea! Have a great trip and let me know if you have anything you would cut, or add! I’ve cut back on the things I pack quite a bit since I wrote this (I should update the post! ), but this all certainly fits. Packing cubes are the best! Let me know how it goes! Love your post! I’m so glad I found it, because my boyfriend and I are finishing preparations for our two-month trip in South America. The last thing that needs to be done is organizing and packing our stuff, and that’s what freaks me out each time. It’s not our first trip, but It’s always a great mess when I start packing. Your checklist makes the things much better. Thank you! Great! Glad it helps! I’ve learned to pack much lighter than even this in the years since I published this, so feel free to cut back even more from this. Safe travels! Very useful information. I love packing , too. My advice is to withdraw cash before you leave. Some countries are with cash-based society. It is really difficult to pay with card there. Greetings! Really good tip! I’ve started doing that myself recently just in case. Thanks for sharing this! I always travel with my kindle. It is something that I don`t miss to put in my backpack.I love it! Thank you for sharing your list! It is really useful. Greetings! Thanks for sharing, Mercedes! Good tip–we have an older model Kindle, but I never got into the habit of traveling with it. Do you carry e-guide books on it, too? I should give it a try again. Yep I carry 🙂 Greets! Great list and incredibly similar to mine. I’ve been packing a swimsuit cover up that doubles as a nightgown. Second best thing I will always pack is a pair of footless tights. 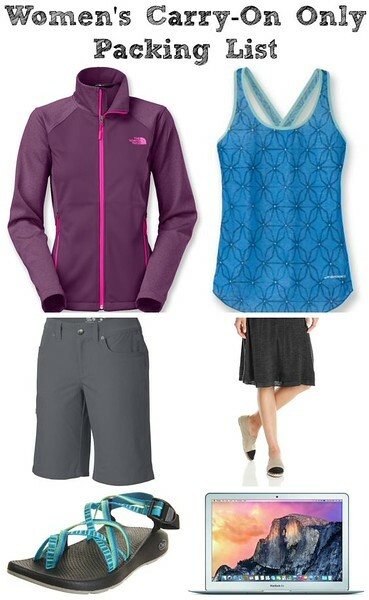 I’ve hiked in them, worn them under dresses, skirts, shorts and capris – they’re really a handy item for keeping you warm and layering. Best thing I ever bought was this dress: http://www.moosejaw.com/moosejaw/shop/product_Lole-Women-s-Energic-Dress_10231452_10208_10000001_-1_ It rolls up to nothing and I have worn it as everything from a swimsuit cover up to a nightgown to a “fancier” dress and with footless tights when the weather got chilly. I bought it for much more on another website and loved it so much I bought 3 of them in different sizes. I always get compliments when I wear it, its moisture wicking and makes me feel good 🙂 The pattern I got was a grey black lined thingy. The one thing I don’t bring anymore is a travel hairdryer. Hairdryers are almost everywhere. Even little guesthouses I’ve stayed in have loaned me one if I had to dry my long locks. Ozigal, is this the dress you have? http://www.6pm.com/lole-energic-dress-black-mix I love it and think I’m going to buy it myself! I didn’t notice that it ties in the front to the little hole at the neck. Very cute! And those are great tips! I’d planning to come up with a more stylish packing list–my one comment on this trip was that I felt frumpy in the cities. I didn’t bring a dress, a nice pair of sandals or dress shoes, just my flip flops and hiking sneakers 🙁 I definitely could have used a few pieces like this! Thanks for sharing! Hmm, what to do… I’m tempted, it’s so cute! I have the same backpack! I was wondering which packing cubes to get because I traveled without them and it was a nightmare!! I’m assuming that because you are recommending the eBags medium they work well with the Kelty Redwing 40L Woman’s? Hi. I’m packing for a very similar trip and wonder how much your bag weighed? I only have half of your list and I am at the 7kg limit? I did not weigh it packed, it was full but it wasn’t too heavy for me to carry comfortably. Hope that helps! Packing list noted for my trip. Thanks much! I really appreciate the information you provide in this article and the packing list. I’m doing a 5 week trip to Chile and Argentina (and a very short side-trip to Machu Picchu in Peru) and am trying to figure out what type of luggage to bring. My trip includes the W Trek in TdP-so there will be some backpacking involved. The logistics are a bit complicated! I see you use the Kelty 40L pack, but the length of the pack is 2″ longer than they allow for a carry-on. This is the challenge I am encountering. The LATAM airlines only allows for a 21″ carry-on limited to 17 pounds. So it looks like I’m going to have to check a bag. I’ll need to bring my overnight pack and probably a rolling duffle. My overnight pack requires accessing everything from the top of the bag–so I’m thinking of bringing a larger rolling duffle bag and actually bringing my overnight backpack inside of it–just empty and lying flat inside. Checking that duffle and bringing a day pack as a carry on. Any tips with regards to this idea?? I’ll be taking about 5 domestic flights within chile and argentina–so lots of flights!